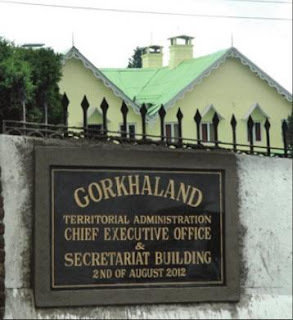 Intensifying its ongoing agitation, the Janmukti Asthayi Karmachari Sangathan (JAKS) today announced it would enforce the closure of the engineering cells of the various offices of the Gorkhaland Territorial Administration from Monday till a solution to its demand for increasing the salary of Group A and B employees is arrived at. Engineers, doctors, managers and curators, who fall under Groups A and B of the GTA, have begun an indefinite cease-work from June 13. Their demand is enhancement of salary as per an order issued in February 2016 by the finance department of the state government. “We started the agitation on June 13 and will intensify it in phases. We have decided to close all the engineering cells of the GTA from Monday to press our demand. We know our decision could create problems for the general public and feel sorry, but we request everyone to support the agitation,” said Deepak Sharma, the JAKS spokesperson. At the same time, Sharma said the present deadlock had eased a bit as the GTA had initiated dialogues with them. The GTA principal secretary and secretary, the deputy chief executive and Sabhasads held a meeting in the afternoon with JAKS representatives at Lal Kothi to discuss the issue. It was decided that the principal secretary would hold talks with the state government and a GTA delegation would leave for Kolkata soon. “The deadlock has been broken and talks have started. However, we will continue our agitation of assembling outside Lal Kothi and close the engineering cells. We will also head to Kolkata as part of the GTA delegation for talks with the state government,” Sharma said.